There is large disparity between global wealth and the US. US adults have 33.4% of world's wealth and only 4.9% of the global population. The differences in the world vs. US wealth/adult show a disparity of 687%. When comparing financial wealth the difference is 906% and 1,560% in the median wealth. Though there is much discussion about the rise of China, the overriding issue it is not only the narrowing differences between China and the US. 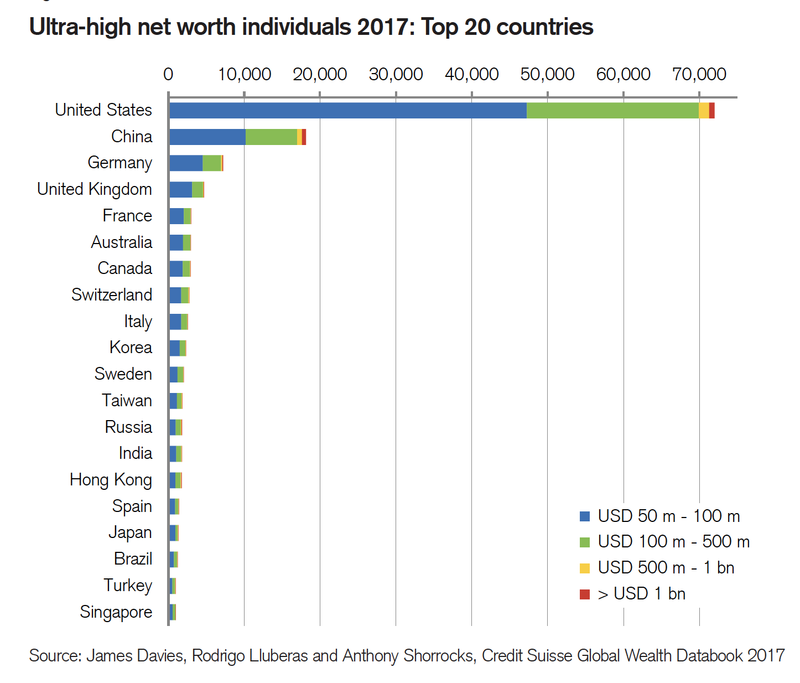 The overriding question is the gap between the extremely small number of rich people in the US and the huge number of the poor in the rest of the world. These differences would be greater if not only the adults but also the total global population is counted. 35% of the world's population are not adults. The increasing gap between the total population of 338 million in the US and the total global population of 7.6 billion inhabitants will be discussed in other postings. The above graphics shows that 0.7% of global adults, or 36 million, hold a 45.9% share of global wealth. 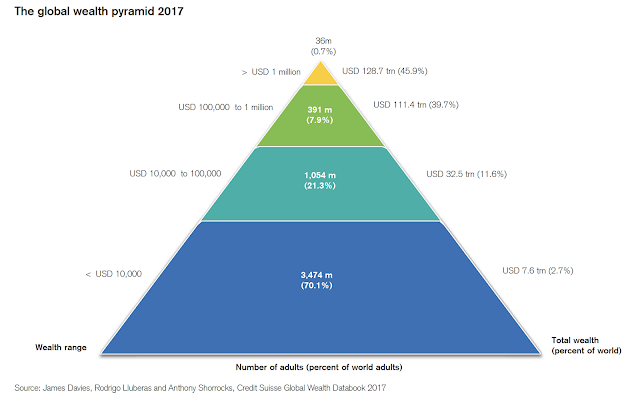 In contrast, 70.1% of adults, or 3.5 billion, hold only 2.7% of global wealth. 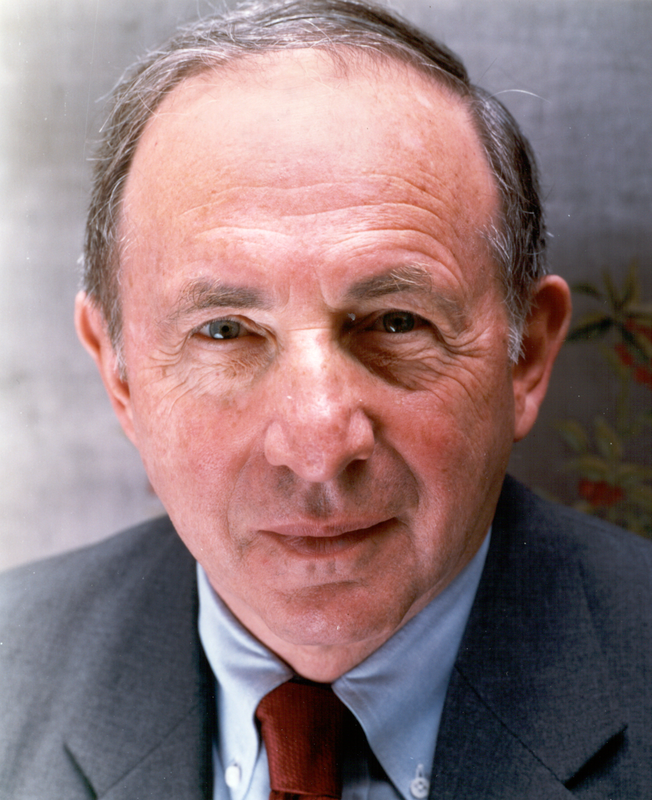 The disparity between the poor and the rich is therefore dramatic. The above displayed wealth layers do not disclose details what adults hold between $1 million and $10,000 in wealth. In follow-up postings it will be shown that in this segment there are even greater differences in the ranges of wealth between millionaires and billionaires. 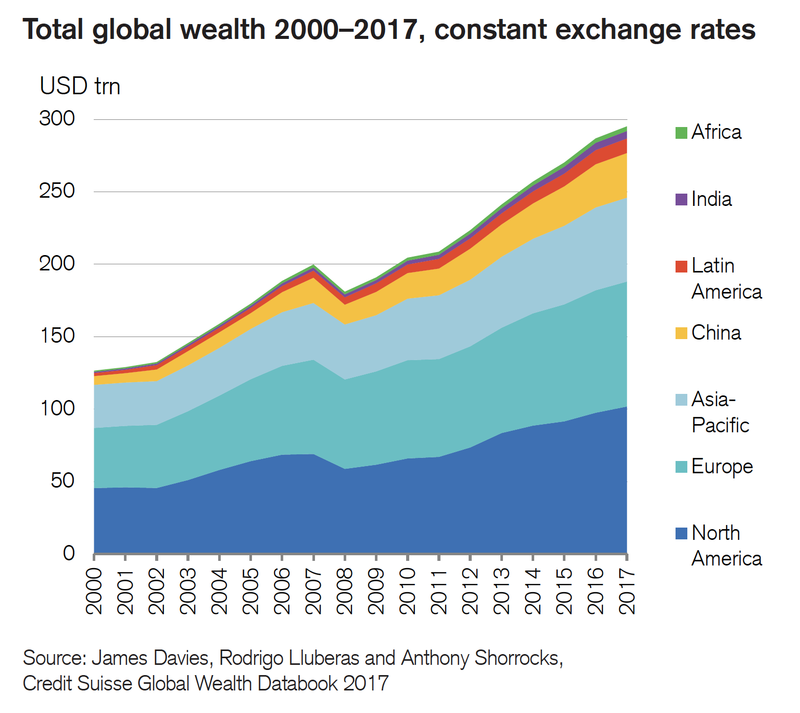 If global wealth is distributed not on a dollar basis but on currency exchange rates, such layering would leave hardly any assets for Africa, India and Latin America. 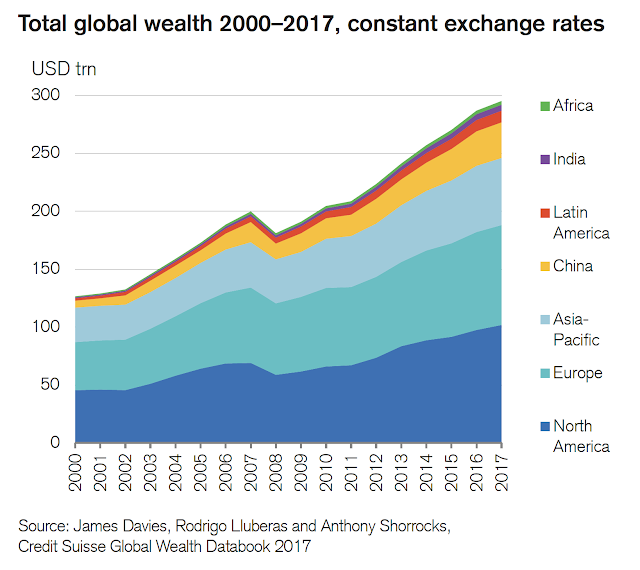 What is remarkable is the rise in wealth in the Asia Pacific and China regions since year 2000. However, these all segments outside of America and Europe still account for less than a third of the global total. There is only a steady rise in the importance of the Pacific countries. 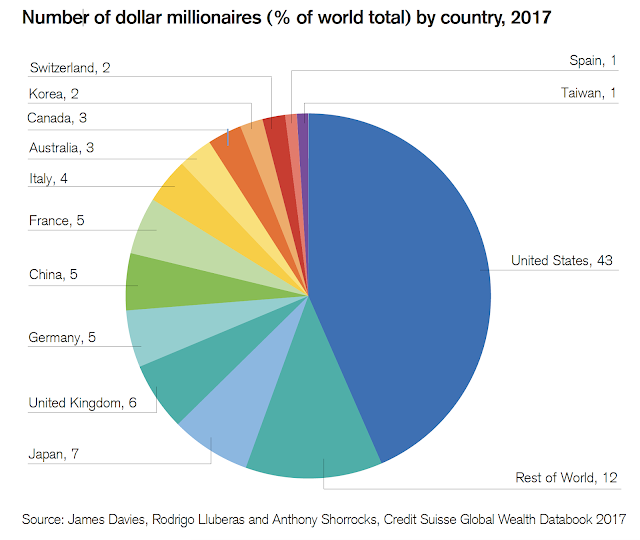 When the wealthy with assets greater than $50 billion are counted, the dominance of the US over the rest of the world is overwhelming. Includes a small number of multi-billionaires. When viewed from the standpoint of wealth as the basis of history the challenge to our civilization at this point is the global prevalence of poverty and not the presence of wealth except for a few. Historically, that has always the cases as emperors owned everything and little was left for everybody else. What is different now is medicine without borders, international trade without borders, communications without borders and the visibility of the holders of riches without borders. When the perspective of viewing mankind's futures can be extended from the current months to a prospective that spans decades, a different future may emerge. In the past societies were constructed in days or weeks, one country at a time. Human civilization may now be emerging to view its directions in terms of many years ahead, applied on a larger geographic scope than ever before.